This is a review of NOW CoQ10. 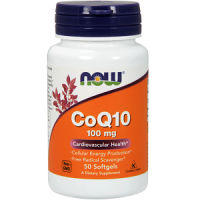 Coenzyme Q10 (CoQ10) is a substance that is essential for cellular energy production. The manufacturer’s claim that this supplement can help maintain a healthy heart and vascular system, and also protect the body against cellular damage from free radicals due to its antioxidant properties. Find out more about NOW CoQ10 by reading our review. See if it is an effective dietary supplement for cardiovascular health. 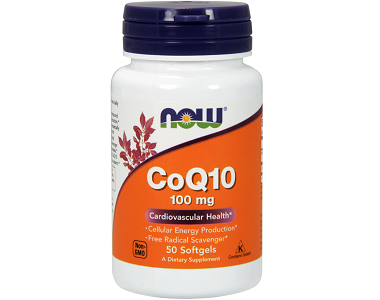 The main active ingredient in this product is CoQ10 which provides support in cardiovascular health and also acts as an antioxidant. At only 100mg of CoQ10 per pill even with 2 doses a day this is still below the recommend daily intake of CoQ10 that other brands recommend. Vitamin E is also acts as an antioxidant to prevent the body against cellular damage from free radicals. The product is not manufactured with wheat, gluten, soy, corn, milk, egg, fish, or shellfish ingredients, however it is produced in a facility that contains these allergens. The product lacks BioPerine which is needed to improve absorption and bioavailability of the main active ingredient. Without this ingredient, the product may be ineffective. How Do You Use Now CoQ10? Take 1 to 2 softgels per day with a meal. The time of day is not specified and may render the product ineffective if taken incorrectly. Furthermore, the minimum effective dosage is 250 mg, whereas this product only provides 100 mg. The product may contain allergens, and is only intended intended for adults. Consult a healthcare practitioner before use especially if you are pregnant, lactating, or on medication. NOW CoQ10 can be purchased from the manufacturer’s website. A bottle of 50 softgels costs $21.99 and a bottle of 150 softgels is $55.99. The manufacturer does not offer a new customer nor bulk purchase discount. We were unable to find a money-back guarantee or refund policy. We recommend strongly to only choose a product that provides a strong money-back guarantee. There were a number of things that we liked about NOW CoQ10. The product is not manufactured with wheat, gluten, soy, corn, milk, egg, fish or shellfish ingredients. The pills are in a softgel format and easy to swallow. 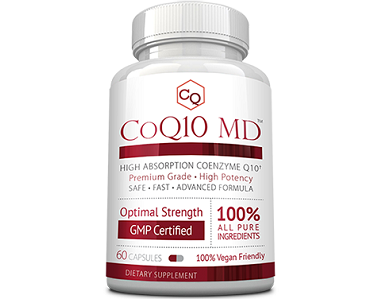 The supplement contains only 100mg of CoQ10 per pill and even with 2 doses a day this is still below the recommend daily intake of CoQ10 that other brands recommend. The bottle of 50 capsules at 2 doses a day is only enough for 25 days which is not so helpful to the consumer. Although quite a natural product we were disappointed to see that the supplement contains bovine gelatin and therefore is not suitable for vegans and vegetarians. The manufacturer does not offer the a new customer nor bulk purchase discount. NOW CoQ10 also is lacking a key ingredient, BioPerine, which is needed to improve absorption and bioavailability of the main active ingredient (CoQ10). Without this ingredient, the product may less effective. Lastly, the manufacturer does not stand behind its product with a guarantee. We recommend you only look for a CoQ10 product that has BioPreine, contains a higher dose of CoQ10 per pill to make up 250mg per day, and that it comes with a strong money back guarantee.